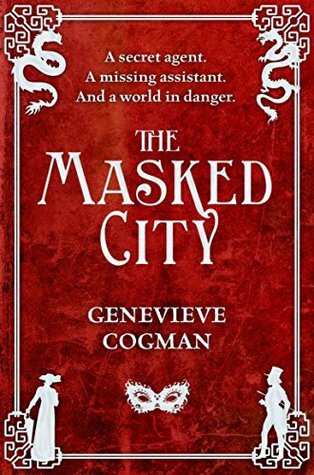 The Masked City is the second book in a series. If you've read my review of The Invisible Library, you might guess how much I've been looking forward to this. In fact, I re-read the first book in November, just to remember all the characters and be ready for the second. The Masked City starts a few months after the events of The Invisible Library. Irene is solidly installed as Librarian in Residence in the slightly chaotic London we have come to know and love in the first book. Kai is still her apprentice and friend, and Vale, the intrepid detective, is very much a trusted peer. After acquiring a book at an auction, Irene and Kai find themselves the center of unwanted attention from hired werewolves and thugs. Things quickly get worse and when Lord Silver (an enemy) delivers a warning, they begin to wonder whether they've been underestimating the danger they are in. When Kai is kidnapped, Irene has to rely on Lord Silver for assistance. The rest of the book is essentially a chase story, with Irene trying to get to Kai and save him before disaster strikes, all while delving deeper and deeper into the chaotic realms and machinations of the Fae. The Invisible Library introduced the reader to a fantastical premise and world, excitingly mysterious and memorable characters, and, while involving them in a plot of intrigue and suspense, molded some of them into friends. The Masked City, on the other hand, plays Irene largely on her own, pitted against insurmountable odds in a quest to save a friend and a world, but with much less bonding and not much relationship forming. This is not to say that The Masked City is boring - it is a funny novel. Not quite as rich in jokes as a Terry Pratchett novel, but on a par with a Ben Aaronovitch one. The adventures are good fun, Irene gets into trouble a lot and there's still a good dose of vim in the book. But there is less mystery (we more or less know who the villains are from quite early on) and less teambuilding, which renders the story a bit flatter. Irene is a fabulous character, but she really flourishes when we see her interact with (potential) friends and allies. Being slightly less absorbed allowed my brain to get distracted by questioning the logic of the world in these books. I started wondering whether there was really that much difference between the magic of fae, the magic of librarians and the magic of dragons, and why there should be any conflict between them. Similary, the Library's neutrality (even though they strongly favour the dragons and are prejudiced against the fae) started to feel less convincing. I think it's that more than anything else which tells me that The Masked City is not quite on a par with The Invisible Library: when I start to chink away at the internal logic of a world (and my suspension of disbelief), then the story is not quite as compelling as it should be. Still, for a light & fun read, I'd recommend it.